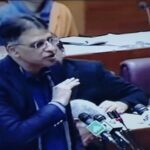 KARACHI: Finance Minister Asad Umar on Saturday said that planned mini budget will be announced on January 23, 2019. “Earlier it was decided to present the supplementary finance bill on January 21 but due to foreign visit by the prime minister the date has been rescheduled to January 23,” the finance minister said during his visit to Karachi Chamber of Commerce and Industry (KCCI). The finance minister said that the purpose of mini budget was not to increase the revenue but to improve investment and reduce tax burden on business community. He said that enhanced investment to ensure economic growth. The finance minister said that the savings in Pakistan was the lowest in the world. The government priority is to improve savings and investment. Asad Umar said that the economy was being operated on consumption environment, which had widened the trade deficit to an alarming level. “We are trying to improve exports to curtail the trade deficit,” he added. He said that the mini budget would focus on people having huge incomes and assets but not on the tax net. The finance minister said that Pakistan’s trade with regional countries would be increased. “Due to various issues with India, Iran and Afghanistan the regional trade cannot be improved,” he added. He further said that Pakistan wanted good political and trade relations with India. The finance minister hinted tax concessions to stock exchange in the mini budget. Earlier Siraj Kassem Teli, Chairman, Businessmen Group said that there were various issues, which needed attention on priority basis. He said that the provision gas supply to industries was major issue. “The government had assured availability of gas for industries. But the gas utility stopped it,” he added. The gas supply should not be stopped even for one day, he said and added that finally the prime minister had to resolve the issue and removed high officials of both the gas utility providers. He urged the finance minister to find out permanent solution to this issue. He further demanded that the gas supply to Sindh should be ensured and LNG should be supplied to across the country.